Sam and Kacie Malouf established Malouf Fine Linens in 2003 and created a business of manufacturing luxury sheets that would be available to everyone, at affordable prices. The high standard of quality, demanded by the company early on, allowed Malouf Fine Linens to quickly be considered a luxury brand. Mattress Mike's is proud to offer these fine bedding products to our Santa Barbara area customers! 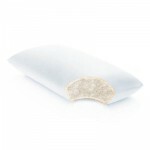 Inhale the refreshing aroma of peppermint before drifting off to sleep with the aromatherapy Z™ Shoulder Zoned Dough® Memory Foam Pillow with Peppermint. 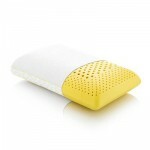 Plush, pressure-easing Dough® memory foam is infused with the scent of chamomile for cozy, natural relaxation. Roman chamomile is known for its soothing and relaxing properties. 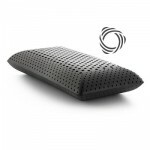 Infused with activated bamboo charcoal, this hypoallergenic pillow regulates moisture, odor, and temperature, making it great for people with allergies or asthma. The Z™ Shoulder Zoned Dough® Pillow with Bamboo Charcoal brings you excellent pressure point relief, odor and moisture control, and comfort thanks to the unique shoulder design created specifically for side sleepers. The Z™ Zoned Dough® + Bamboo Charcoal pillow brings you the benefits of memory foam pressure point relief combined with the odor and moisture control of bamboo charcoal. Bamboo charcoal has many great qualities: it eliminates odors, absorbs excess moisture, regulates temperature, and is an excellent choice for people with allergies. 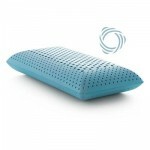 Infused with temperature-regulating gel, this refreshing pillow draws heat away from your body for a cooler, more comfortable sleep. The Cotton-encased Down Blend pillow offers the traditional feel of a down pillow with added comfort features to help ensure restful sleep. Utilizing one of the thinnest fibers known to man, the Gelled Microfiber™ pillow offers the luxurious feel and benefits of down, without the odor, allergens and sharp quills. The right softness and support, combined with natural aromatherapy, creates a truly relaxing experience. Plush, curve-conforming Dough® memory foam is infused with real lavender oil for cozy, natural relaxation. 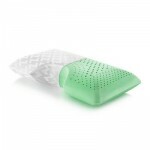 Comfort and support meets natural aromatherapy with the Zoned Dough® Peppermint pillow. Plush, curve-conforming Dough® memory foam is infused with real peppermint oil for natural relaxation. 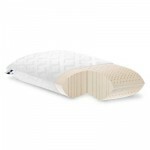 Made with 100% natural Talalay latex with no synthetic additives, the Zoned Talalay Latex pillow offers a responsive foam that can help relieve sleeping pains. 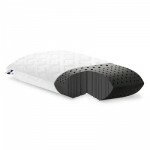 Combining the cooling benefits of Gel Dough® with the comfort and breathability of Zoned Technology™, the Zoned Gel Dough® pillow offers optimal comfort for restful sleep.